Escape Tokyo for a day and admire some of Japan’s most scenic sights on this 10-hour tour with a tour conductor. 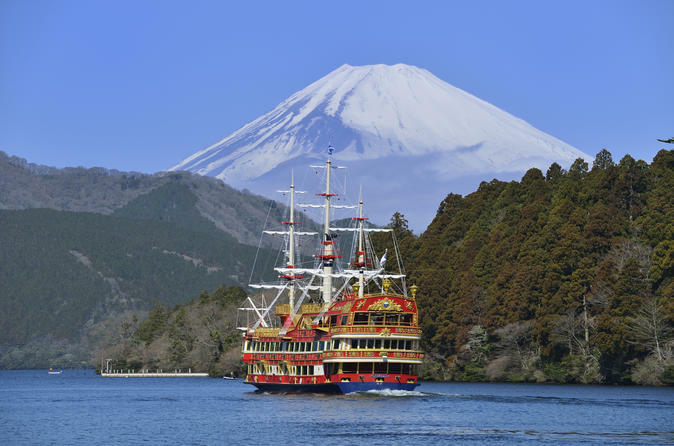 You’ll stroll around Odawara Castle grounds, the longest pedestrian bridge Mishima Skywalk, and will als take a relaxing Lake Ashi cruise on a replica pirate ship in Hakone. Enjoy great photo ops of this iconic snow-capped mountain, and fill up on a buffet lunch. Your exciting day trip begins with pickup at selected hotels in Shinjuku, Tokyo by coach. Then relax on a scenic 2-hour transfer to Odawara located in Kanagawa Prefecture. Upon arrival, the coach will stop at Odawara Castle Park. The castle is dated back to the mid-1400s and has been rebuilt a few times. Stroll around the castle for approx. 40 to 50 minutes. If you travel in late March, you might also be able to see beautiful cherry blossoms blooming in the grounds. Later, go to the nearby local restaurant for an all-you-can-eat seafood buffet lunch featuring Japanese, Chinese and Western style food. After lunch, you’ll be driven to Hakone for a 30-minute Lake Ashi cruise on a replica pirate ship. While you glide across the crater lake, enjoy the fresh air and, on a clear day, also admire the mesmerizing view of Mt Fuji, Japan’s highest mountain with an elevation of about 12,300 feet (3,770 m). Afterwards, head to the next destination - Mishima Skywalk, Japan's longest pedestrian-only suspension bridge, and stroll around for approx. 1 hour. On a clear day, stunning uninterrupted views of Mt Fuji can be seen. When the tour concludes, your coach will take you back to Shinjuku. *Please note that this tour has not visited Mt. Fuji New 5th Station since 2017 and from 2018, crab will be unavailable for lunch and is replaced by a seafood BBQ instead.